Almost all losses of aviary birds during the winter can be prevented by thinking and planning ahead. There is no doubt that our weather has become more windy in recent years. This can result in serious losses, through aviaries that cannot stand up to gales and because draughts can be deadly for birds. We should protect and locate our aviaries with this in mind. Now is the time to strengthen the roofs of aviaries, before those autumn gales. Be certain that they are properly secured using nuts, bolts and washers. There is no excuse for flimsy aviaries when the lives of your birds depend on sound construction. Not only is it false economy in the long term but escaped birds suffer horrible deaths from starvation, cold, or hawk predation. Needless to say, aviaries and their mesh must be scrutinised carefully in case repairs are needed. We all need reminders of what can go wrong if we become too blasé. Take draughts for example. 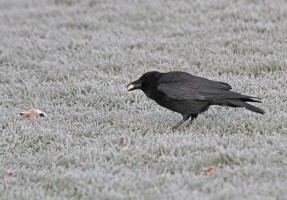 In colder weather they can be killers for birds. In the case of cages within a building that lead to an outdoor flight, the wind that enters through the exit hatch could mean that birds are sitting permanently in a draught. For this reason the exit should be well below perch level. It can be at floor level in half-depth inside cages. Reducing the wind-chill factor is extremely important. The best method is to protect the sides of the aviaries, or those that take the brunt of the wind, with corrugated PVC sheeting, properly secured. This can be attached to wooden frames that are screwed into position or the sheeting can be bolted directly on to aviary framework. 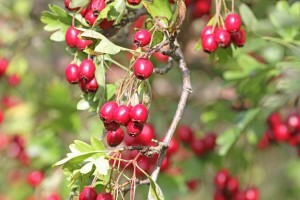 Elder berries and Hawthorn berries. Most parrots are hardy. Cold alone will not have a harmful impact on healthy birds. However, young parrots are less tolerant of uncomfortably low temperatures - something that should always be borne in mind. They are often less sensible about perching in sheltered positions. Before the onset of cold weather, carefully examine all your aviary birds. If any are underweight, they are the ones least likely to survive the winter. Steps should be taken to ascertain why this is the case, with a check by an avian vet if possible. At least make an appropriate alteration to diet or accommodation, or remove a dominant companion who is harassing a bird at feeding times. Birds in outdoor aviaries must be in good health to withstand our often rapidly fluctuating winter temperatures. Special attention needs to be paid not only to diet but also to the way food is provided. A seed mixture that is appropriate during summer months might fail to provide sufficient energy in cold weather. Seeds rich in oil such as hemp, perilla, sunflower and safflower, can form a higher proportion of a seed mixture. Sprays of seeding dock that have been cut, dried and stored are useful then, and also provide a treat. Birds with special feeding requirements, ie food that could freeze, should always be housed in aviaries with access to indoor quarters, with flaps or doors that permit the birds to be shut inside at night. Lories and other species which feed mainly on nectar would have to be fed at least four times daily if the food were outside and the nectar froze. This would be impossible for people working long hours. Protecting the food from mice is of the utmost importance, especially in a colony aviary where it is difficult to control the amount of food eaten by individual birds or pairs. Electric lighting is as essential as heating in most cases. It enables birds to feed for longer periods, thus maintaining their body temperature. Food is converted to energy, that is, heat. A small species, such as a parrotlet or lovebird, makes the most efficient use of its food at about 80oF (27oC). The lower the temperature drops, the greater the intake of food needs to be. I am not suggesting that indoor quarters are heated to this degree - about 54oF (about 12oC) is adequate for most species. However, I am suggesting that the quantity of food might need to be slightly increased. A dimmer switch is recommended in all birdrooms, so that birds are not suddenly plunged into darkness nor woken up by bright light. The lights should be dimmed at approximately the same time each night as birds have an acute sense of time and establishing a routine is good for them. Vitamin D deficiencies are common in captive birds kept with insufficient dietary vitamin D, and inadequate ultraviolet light to facilitate its absorption. Many psittacine birds are fed a high-seed diet; seeds are deficient in this vitamin. The availability of UV bulbs for lamps in holders made to stand on top of a flat cage or at its side, or in table lamps, has made the provision of ultraviolet light so easy. One or two hours exposure daily is enough. Prolonged exposure can damage the eyes. (Look out for a future article giving more detail on this subject! - AKJ). In outdoor bird rooms, heat is lost through windows. In cold weather when there is no need to open windows, I always tack heavy bubble-warp over them. If the birdroom door is not a tight fit, I would suggest hanging a heavy curtain over it to cut out draughts. One of the worst winter problems is frostbite. This should never happen. If it does, to me it indicates a lack of care. The outcome is a painful loss of toes or even the whole foot. I once saw an aviary parakeet hanging by its beak from the roof. It had no feet, only stumps. Such neglect is totally unforgivable and can be prevented. Wide wooden perches encourage a lower roosting stance, thus feathers protect the feet. It is totally irresponsible to use metal perches. In my opinion, no parrots should spend winter nights in outdoor enclosures in northern Europe. All aviaries should have an indoor section. Most members of the parrot family soon learn to enter when the carer approaches at night. I know some people will say "They prefer to roost outside!". It is just a matter of training and the right conditions. If the highest perch available is in the inside quarters, and these are well lit, then parrots will enter. Remember that some birds will roost on top of a nest box if this is the highest point, so if nest boxes are retained during the colder months, they should be inside. In my experience, if birds don't want to go inside then you net them and place them there. Most parrots hate being caught so after two or three evenings they decide that voluntarily entering the house is the better option! Roosting outside is a major cause of mortality. Birds of all species are vulnerable to rats and stoats (in badly maintained aviaries), or cats, hawks and owls. Night frights caused by fireworks, security lights or vehicle headlights are other dangers. Wind, snow and frost at night can be lethal. Birdrooms and inside quarters must be properly insulated and maintained to keep out draughts and damp. If the area is damp, look for the source of the problem and correct it. Pay special attention to keeping the roof watertight. If the felt is leaking, treat it with liquid bitumen or renew the felt. Meanwhile, retain a low level of heating to prevent mould forming, as this can have serious disease consequences for birds. In very wet weather I use a dehumidifier in the inside quarters. If you cannot get up early in the morning, my advice would be - don't keep birds! It is so important to inspect all birds at first light, especially during cold weather - or earlier if you have outside lights. A sick bird found early in the day can often be saved when placed under a ceramic infra-red lamp. Because sick birds deteriorate so quickly, this might not be possible later in the day. Also inspect your birds prior to dusk. This might save the life of a sick bird, which would not otherwise have survived the night. If you are unable to inspect your birds at first light in cold weather, then do not give them access to the outside flights until you can. Always remember, their lives are in your hands! A careless attitude to their welfare is not acceptable.